Long Travel Industries introduces their new Kawasaki Teryx Long Travel kit. It is designed to be a 100% bolt on kit, which gives the Teryx a 5” over stock increase in A-arm length per side. 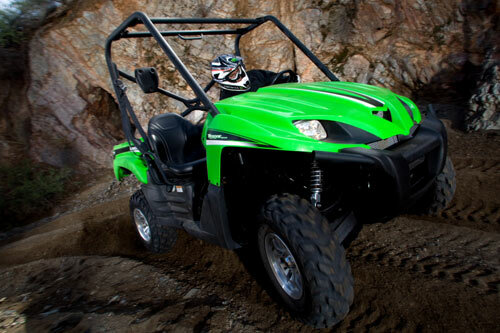 After extensive R&D on the Kawasaki Teryx suspension needs, Long Travel Industries produced a 5″ over stock increase in A-arm length per side with a wheel base alteration combined total of 2”. The wheel travel has been set at 14″ in the front to prevent C/V binding at full droop with the wheels turned, and a matched 14” of travel in the rear. These specifications were engineered to minimize push in the corners and give ample tire clearance with an aggressive look. The A-arms are constructed from 4130 Chromoly plate and fully TIG welded for the ultimate design in rigidity and toughness, yet coming in under weight than most other round tube kits. All chassis pivot points are precision machined which allows the use of the stock bushings and crush sleeve. Both front upper and lower A-arms use a 7/8” stainless steel Teflon coated bearing to replace your stock ball joints. Long Travel Industries 17-4 stainless steel misalignments / taper pins and adapters are used to bolt the A-arms to the factory spindle for maximum strengths and articulation. The kit includes four King Shocks specifically valved for Long Travel Industries and is also complimented by Long Travel Industries own front and rear 300M axles. All of the kits ship with all 4 spherical bearings preinstalled for your convenience. Total installation time is 5-7 hours, with professional technical support available. No drilling is required. As a final quality assurance test, every A-arm goes through a final packaging Q/C fixture to make sure that you will not need a come-a-long, a ratchet strap, a sledge hammer or a grinder to install their A-arms. Long Travel Industries is once again delivering a suspension system that will take all the abuse you can throw at it and is backing it by their unconditional lifetime guaranty on all A-arms.